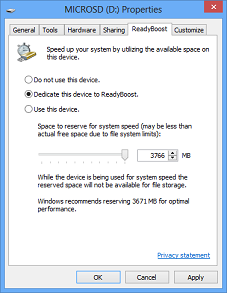 Ready Boost is a software designed by microsoft and implemented from earlier versions of windows for the sole purpose of give you a solution to supstitute RAM with a USB. DON'T GET ME WRONG A USB CANT REPLACE RAM!!! What i mean by that is that when a computer runs with 1GB or 2GB or ram and you use ready boost it will make a defference even if RAM is 100x faster than the speed will be of your USB. Ram will still be the best option but when you dont have the money rather use your USB. *The Flash Drive Must Be Compatible With Ready Boost. * USING READY BOOST CAN REDUCE THE LIFESPAN OF YOUR FLASH DRIVE. *Ready boost is already a Feature on your machine that can be used. *Go and format you Flash drive to exFat. *Cnfigure It as in the picture on top if you have 1GB/1024 MB please say 900MB. Or use the default amount. Restart your PC and your good to go faster. Doing this on a computer with ram more that 4GB can even slow down your PC but wont give you noticeable faster results so use it on systems slower than 4GB.